Rebecca Trovatelli thought for sure she’d be in a better place when she reached her 30s. Yet here it is, her 33rd birthday, and she is only doing well at one thing: waiting. Waiting for her career to finally go in the direction she wants. Waiting for her children to finally listen to her. Waiting for the love of her life to realize he’s ready to commit. In the meantime, she is haphazardly navigating the trenches at preschool, and trying to win over the mothers who seem so much better equipped to parent than she is. She is also making a conscious effort not to compare herself to her seemingly perfect friend whose life she mainly follows via a blog, and attempting to be happy for her ex-husband, by all outward appearances, has successfully moved on and started a new life. Then Josh enters the picture. He’s handsome and sweet. Her kids love him. Her parents approve. He takes her out and actually seems to want to be in an exclusive relationship. Suddenly, things are looking up for Rebecca, but by now she should know not to expect it to last for long. When things start to get complicated, Rebecca must reevaluate her life, her friends, and the choices she has made. And in doing so, she might just figure out what matters most. So bar being a bit dazed and confused, which at times made me feel a bit disconnected from the story, I did really enjoy the book. I always enjoy a book that is in diary format – which this is by the way. It greatly portrays how we women tend to think and over-think things. I actually saw a bit of myself in Rebecca when she would make a decision and then say or maybe it’s… or maybe…. In fact it drives my husband bananas. Its a really easy read, I read about twenty pages last night and then read the rest this morning. Its more a novella than a novel. It is that kind of easy reading book that you just don’t see the time passing while you are reading – as I pointed out above. You could take it to the beach, read it on the plane or anywhere really. Nice and light it requires no thought or possesses no complicated story lines that you have to concentrate on. 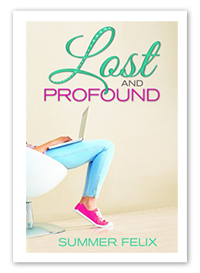 Lost and Profound is the perfect summer read; short, easy reading and very humorous. I found myself giggling my way through from start to finish. So even with all my issues I enjoyed and would recommend it!